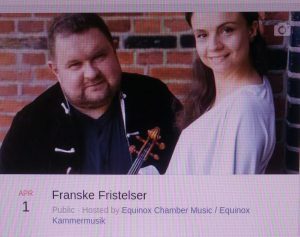 “Franske fristelser” - "French temptations"
As regular participants of the yearly Equinox Chamber Music Festival Duo will take part in a recital of french music. Duo will perform sonatas of Poulenc and Ravel, but Anton and Julia will also add an unexpected Spanish twist to a program! After the big succes last year, Duo will return with the new exiting project - "Musikaliska Akvareller". In the program - music of Beethoven, Bernstein, Tor Aulin and Ravel! Anton will participate at "Christmas Concert with Operette Kompagniet" at Fredensborg Gl.Bio. 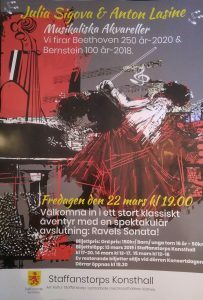 Anton will be leading Jönköpings Sinfonietta as a 1-st Concertmaster with the world premiere of the "John Bauer-svit" by Jonas Valfridsson. Julia and Anton will be recording the second half of their CD "The Pearls from the Northern Seas" (working title). Anton will participate at the premiere of "Die Fledermaus" by Operette Kompagniet at the Theatre Museum, Hofteater. Julia will perform at her solo-recital at Lunchtime Concerts St.Martins-in-the-Fields. Julia will perform at her solo-recital at St.Johannes Church. Julia will participate at Festival Musik vid Dellen with her solo-recital. 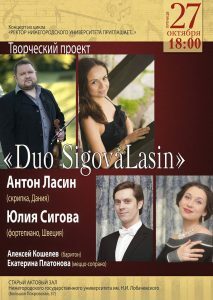 As a part of Equinox Chamber Music Festival, Duo Sigova/Lasine will play a evening recital. The program will include works of Beethoven, Bernstein and Franck. Venue - Koncertkirken: Blågårds Plads 6, 2200 Copenhagen N.
Duo will participate in concert/creative project together with Alexey Koshelev (barython) and Ekaterina Platonova (mezzo-soprano). Duo Sigova/Lasine will paricipate in Chamber Music Concert at the Royal Danish Theatre. 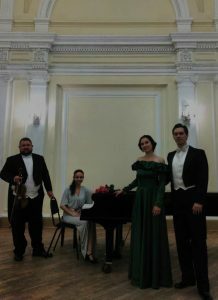 Together with Kim Bak Dinitzen duo will perform Piano Trio No.1 in D-minor by Felix Mendelssohn. Duo Sigova/Lasine will participate in Chamber Music Marathon together with other musicians from the Royal Danish Orchestra. Ensemble will perform E.Grieg Violin Sonata No.1 in F-dur. 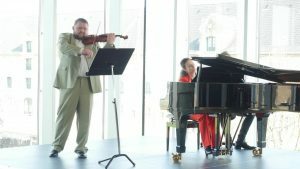 On this Sonata-evening Anton & Julia will present a variety of music from different eras and places. In the program - sonatas of F.Schubert, E.Grieg and S.Prokofiev.